Photography services are always in demand. If you're a photographer, you have the ability to create a very successful work-at-home business by photographing a variety of events, besides the typical family photo shoots and senior pictures. This can allow your business to take a different approach by offering more unconventional photography services. As a mom, this is gold. At our kids birthday party, I'm in charge of the decorations, the cake, the food, the games, and keeping the kids in line. Oh, what I'd gladly pay to have a photographer to come in for a couple of hours and catch all the moments that I just don't have time to do! Birth is a personal thing. Some people are comfortable having others in the room (like a photographer) and others aren't. So you'll have to be aware that not every pregnant mom will be in need of your service, but some will! People also forget about adoption. There were 261,728 children adopted in the United States alone in 2015 according to the U.S. Department of State. So there are many opportunities to offer your service to families who will want to document the special day they bring their child home. People dream about it, save for it, and then get to live it—retirement! Documenting a person's last day of work and introduction to the retired life could be super fun! Let's face it; people are usually thrilled to retire. Many people would jump at the chance to have someone there to record their party, be it at work or with family at home! This story absolutely melts my heart. Maryland photographer, Stephanie Smith, made headlines by offering her services to special needs children and their families. (You can visit Stephanie on Facebook here.) She has a successful photography business and does these photo shoots for free, but it would also be a wonderful service to offer a low-cost option to these families. Many photographers won't take the time or don't have the patience to work with special needs children, so it's a very viable option. I'm not going to lie, this is a tough one and might not be for everyone. There are situations in life such as loss that, although painful, people still want to have documented and like having pictures. The loss of a child at birth, whether stillborn or if they live for a few hours or days, has to be one of the most difficult experiences ever. However, parents frequently want to remember it because that time in the hospital is the only time they have with their baby. There won't be any birthday party photos, no prom, or wedding pics. They want to have something to hold on to that will help them remember their child. You can help them be comforted by offering your services in this time of need. It won't be easy, and as I said, not everyone can do it. But if you have sympathy and tons of compassion, this might be a gig for you. I've also seen end-of-life photos that are beautifully documented by kind and understanding photographers. When an elderly relative is reaching their end days, having an empathetic photographer capture some of what might be some of their final moments can be a blessing to the family and something that they will cherish forever. If you care about people and can handle difficult, painful, and tear-jerking situations, you could use your photography skills to take part in meaningful work. 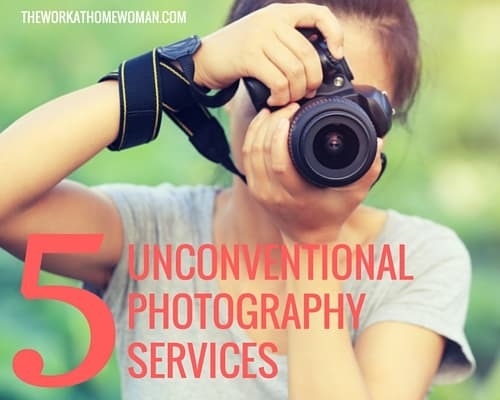 What would likely do the best is if you could offer a variety of the five unconventional photography services above—unless, of course, your schedule is filling up with a particular type of event. In that case, make it your specialty. Become known as a Special Needs Photographer or a Photographer who specializes in parties. 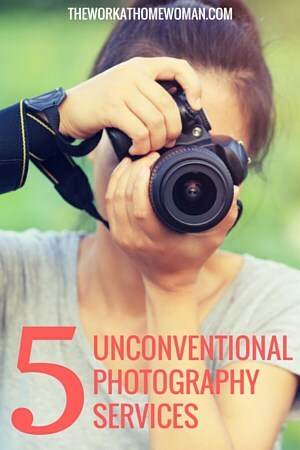 Have you heard of any other unconventional photography services? We'd love for you to share in the comments. Kimi Clark is a career stay at home mom turned writer and blogger for hire with a passion for business. She specializes in posts about writing, blogging and entrepreneurship, as well as all things parenting and motherhood. Owner & Founder of The Mom Shopping Network, you’ll find her there writing, hosting giveaways, and supporting moms in both their business and motherhood journey. She’s also a devoted wife and mother of four who loves the beach and her early morning coffee. Great article! I agree that loss photography is the hardest. Sadly, we didn’t get a chance with mine, but have helped photograph bucket list journeys and final days for family pets. It’s not easy, but you capture so much love. I love that idea, Karyn – bucket list journeys! Thanks for sharing your experience and story!